MARTIN, ABRAHAM (dit “l’Écossais” or “Maître Abraham”), pilot; b. 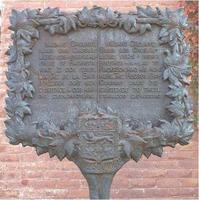 1589 in France; d. 8 Sept. 1664 at Quebec. 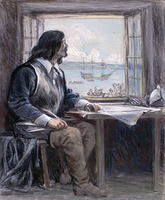 Martin arrived in New France with his wife, Marguerite Langlois, her sister Françoise and brother-in-law Pierre Desportes (the parents of Hélène Desportes) about 1620. Martin may have been of Scottish descent or he might have used the sobriquet if he had been enrolled in military service or had been a member of an illegal organization: such names were used to avoid detection by officials looking for deserted soldiers or in case the records of an illegal organization were seized. It is also possible that he acquired the name because he had made several voyages to Scotland as a young man. There is some question as to whether Martin was really an official pilot or not, although he was referred to as “king’s pilot” in his own day. However, he did fish well down into the Gulf of St. Lawrence. It is presumed that the Plains (or Heights) of Abraham are named after Martin. It is picturesquely said that the “Côte d’Abraham” was the path that Martin used to descend to the St. Charles River to water his animals. His property amounted to 32 acres in all, 12 received from the Compagnie de la Nouvelle-France in 1635 and 20 as a gift from Sieur Adrien Du Chesne, ship’s surgeon to Pierre Legardeur de Repentigny in 1645. This land was sold by the Martin family to the Ursulines in 1667. It is possible that this is the same Martin who was employed by Jean de Biencourt and Du Gua de Monts as navigator on the coast of Acadia, although he would have been very young at that time. When David Kirke captured Quebec in 1629 and left his brother Lewis as governor until 1632, Martin and his family stayed on. 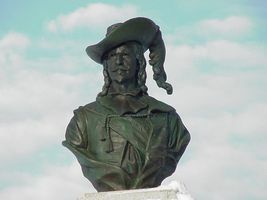 In his later years Martin fell in the estimation of his fellow citizens when he was accused of improper conduct with regard to a young girl in Quebec. He was imprisoned for this on 15 Feb. 1649. As far as can be found from the records, Abraham Martin and Marguerite Langlois had nine or ten children. Anne Martin, born in France and married 17 Nov. 1635 to Jean Côté, was probably not Abraham’s daughter. Eustache, baptized 24 Oct. 1621 and the godson of Eustache Boullé, was the first child born in Canada. Marguerite, born 4 Jan. 1624 and married 22 May 1638 to Étienne Racine, had many descendants, including the two bishops Racine*. 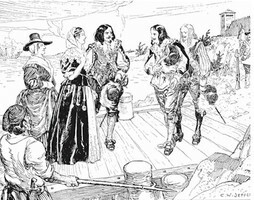 Hélène, born 21 June 1627, was a god-daughter of Samuel de Champlain. 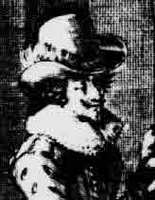 She married first Claude Étienne in 1640 and on 3 Sept. 1647 Médard Chouart Des Groseilliers. Charles-Amador*, born 7 March 1648, the godson of Charles de Saint-Étienne de La Tour, was the second Canadian-born priest. It is possible that Brother Dominique Scot, spoken of in the Jesuit Relations as having gone to the Huron country as a young man, was also a son. 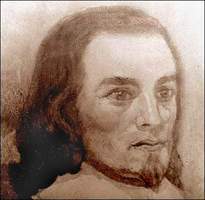 It is also possible that a young man who is mentioned as having been in the Huron country at the same time (1634–35) was Eustache Martin. Collection de manuscrits relatifs à la Nouv.-France, I, 61. JR (Thwaites). R-B. Casgrain, “La fontaine d’Abraham Martin et le site de son habitation,” RSCT, 2d ser., IX (1903), sect.i, 145–55. Dionne, Champlain. A. G. Doughty and G. W. Parmelee, The siege of Quebec and the battle of the Plains of Abraham (6v Quebec, 1901), II, 289–309. John Knox, An historical journal of the campaigns in North America for the years 1757, 1758, 1759 and 1760, ed. A. G. Doughty (3v., Champlain Soc., VIII-X, 1914–16), II, 97n. J. M. LeMoine, The Scot in New France, an ethnological study (Montreal, 1881). É.-Z. Massicotte, “Au sujet d’Anne Martin,” BRH, XXVIII (1922), 116–17. Léon Roy, “Anne Martin, épouse de Jean Côté,” BRH, XLIX (1943), 203–4. 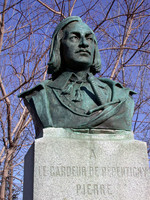 P.-G. Roy, La ville de Québec, I, II. Tanguay, Dictionnaire. Henry B. M. Best, “MARTIN, ABRAHAM (dit “l’Écossais” or “Maître Abraham”),” in Dictionary of Canadian Biography, vol. 1, University of Toronto/Université Laval, 2003–, accessed April 21, 2019, http://www.biographi.ca/en/bio/martin_abraham_1E.html.